Written for health professionals of all kinds—not lawyers— Medical Law and Ethics covers the full spectrum of topics that affect practice. Fully updated coverage includes: the legal system, professional liability and medical malpractice, physician’s responsibilities, medical records, ethical and bioethical issues, and current regulations. Actual legal cases illuminate subjects ranging from patient confidentiality and abortion to death and dying. Med Tips provide quick scenarios and guidance about law and ethics. 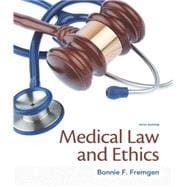 Each chapter contains glossary terms, exercises, and an actual case; appendices provide current sample codes of ethics. Bonnie F. Fremgen, Ph.D., is a former associate dean of the Allied Health Program at Robert Morris College and was vice-president of a hospital in suburban Chicago. She has taught medical law and ethics courses as well as clinical and administrative topics. She has broad interests and experiences in the healthcare field, including hospitals, nursing homes, and physicians’ offices. She currently has 2 patents on a unique circulation-assisting wheelchair. Dr. Fremgen holds a nursing degree as well as a master’s in healthcare administration. She received her Ph.D. from the College of Education at the University of Illinois. She has performed postdoctoral studies in medical law at Loyola University Law School in Chicago. Dr. Fremgen has taught ethics at the University of Notre Dame, South Bend, Indiana; University of Detroit, Detroit, Michigan; and Saint Xavier University, Chicago, Illinois.